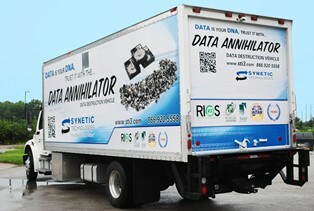 The self-contained mobile shredder, known as the Data Annihilator™, is the latest service Synetic offers to help protect a company’s greatest asset – its data. With compliance regulations constantly evolving and more breaches resulting in legal settlements running in the millions, companies are seeking tailored solutions to their specific IT asset disposition needs. “Many companies have IT assets that contain proprietary information. Internal policy prohibits these assets from leaving the premises before the proprietary data they contain is destroyed. Other confidential information stored on these assets are protected by Acts and regulations, and as recent court cases prove, companies are being held accountable for protecting that information from breaches. Especially in heavily regulated industries, on-site destruction of hard drives and other assets is the only safe and secure option they have,” explains Gary Agness, Vice President, Synetic Technologies. Clients can witness the destruction from inside the truck or from their PC, Smartphone, or Tablet via the Data Annihilator™ Companion App. On-site destruction eliminates any possibility of a data breach since the IT assets never leave the customer’s facility. The Data Annihilator™ solves the challenges companies across the banking, finance, healthcare, and government sectors face when protecting their data from falling into the wrong hands, resulting in the subsequent legal, financial and PR consequences of a breach. Learn more about on-site data destruction, or contact us today to schedule a time to have your data annihilated.